4. Preheat oven to 400 degrees. Lay 6 strips of bacon on a cooling rack placed over a parchment-lined baking sheet; transfer to oven, and bake until crisp and browned, 15 to 18 minutes. 5. Toast bread, and spread one side of each slice with mayonnaise. Arrange lettuce on two slices, followed by tomatoes and bacon. Season with salt and pepper. Top with remaining bread slices, and cut on the diagonal. 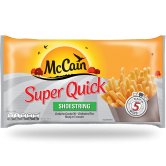 Serve immediately with McCain Shoestring Fries and a side of tomato sauce. 4 Preheat oven to 400 degrees. Lay 6 strips of bacon on a cooling rack placed over a parchment-lined baking sheet; transfer to oven, and bake until crisp and browned, 15 to 18 minutes. 5 Toast bread, and spread one side of each slice with mayonnaise. Arrange lettuce on two slices, followed by tomatoes and bacon. Season with salt and pepper. Top with remaining bread slices, and cut on the diagonal. 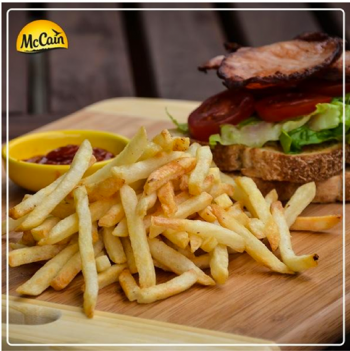 Serve immediately with McCain Shoestring Fries and a side of tomato sauce.